Review: Man of Steel – Geek Girls Rule!!! Best. Superman. Movie. Ever. Superman has been rebooted for the 21st century, but he’s still recognizably Superman. Sent to Earth from a doomed Krypton by his birth parents Jor-El and Lara (Russell Crowe, Ayelet Zurer), Kal-El is adopted by the Kents (Kevin Costner, Diane Lane). As an adult, Clark Kent (Henry Cavill) engages in anonymous, non-costumed acts of heroism that bring him to the attention of reporter Lois Lane (Amy Adams). When Krypton’s General Zod (Michael Shannon) arrives on Earth looking for Kal-El and an object of importance he possesses, will Clark finally stand before the world as Superman? Will the world fear him or embrace him? This is the best film from director Zack Snyder (300, Watchmen) to date. I was nervous when he was announced as director. His films have been either hit or miss for me, and I didn’t know which way this one would go. Snyder has often placed pure visual style above other elements of cinematic storytelling. This time, however, the visuals generally don’t get in the way of the fundamentals of storytelling, and the result is an exciting, sometimes moving, take on the world’s first superhero (who turned 75 this year). There’s action, character-based drama, touches of humor to counterbalance the serious tone, and Snyder successfully brings it all together. The screenplay by David S. Goyer (Blade, Batman Begins), based on a story by Goyer and producer Christopher Nolan (director of The Dark Knight trilogy), captures the essence of Superman while reinterpreting it in a thoroughly contemporary manner. The film opens on Krypton, but quickly shifts to an adult Clark Kent in action. The development of Clark from child to man is shown in flashbacks throughout the film. Superman is about action, and his origin is already well-known, so quickly putting the audience into heroic action scenes makes sense, and the non-linear backstory is effective. If it’s serious in tone, it’s not humorless or overly dark (for the most part, but the attack on Metropolis is grim in the sheer scale of destruction). We see more of Clark’s youth than in previous films. We see just how terrifying having super senses suddenly kick in would be, and how he’s taught to control those abilities. We see how much of who Clark becomes is due to both his birth parents and his adoptive parents. Some tweaks have been made to the Superman mythos. None of them really change who Superman is (although Silver Age comics or Superman: The Movie purists might disagree). This is still Superman, the last son of Krypton, raised in Middle America, and a hero, created by Jerry Siegel and Joe Shuster. To mainstream audiences and critics who know Superman primarily through the Christopher Reeve films, some of the changes may be surprising. The reality is Superman has been interpreted in many different ways, in many different mediums, since his debut in 1938. Writer/artist John Byrne’s mid-1980s comic book reboot (which began with the Man of Steel limited series) seems to be a key influence on this film. There are also nods to the messianic elements present in Superman: The Movie and Superman Returns (perhaps too on the nose here with Superman’s age being 33). One change is similar to something in the final season of the Smallville television series. The final conflict between Superman and Zod ends in a way which will be controversial. Superman took the only action he could in the situation, and it’s undeniable that he was affected by it (screenwriter Goyer wisely avoids the stereotypical action film glib one-liner). Perhaps not entirely consistent with the Big Blue Boy Scout interpretation of the character from the Silver Age of comics or the Reeve films (the ambiguous fate of Zod in the theatrical cut of Superman II aside), but Byrne’s Superman #22 in October 1988 saw Superman do something similar to Zod. It remained canon for a long time, and was much worse than what happens here. I do take issue with the sheer scale of destruction in the film’s final act. This is the only time when spectacle overwhelms the story. The destruction could have been dialed back a bit, to a level similar to The Avengers or even a 9/11 scenario where a few buildings are destroyed, without losing the power of the scenes. At the end, it seems like Metropolis is, incredibly, already back to normal. This criticism isn’t just aimed at this film. It’s a problem with other films, television shows, and comics (where a city is demolished and is back to normal within a few issues), too. Cinematographer Amir Mokri (Fast & Furious, Transformers: Dark of the Moon) provides a somewhat muted palette and a textured lighting scheme, which is stylish without overpowering the storytelling. There’s a certain quality to it that comes from being shot on film rather than the now almost ubiquitous digital. Mind you, digital can look brilliant, but there’s just something about celluloid. In many ways, the look of the film is closer to producer Nolan’s Dark Knight trilogy, which was also shot on film. 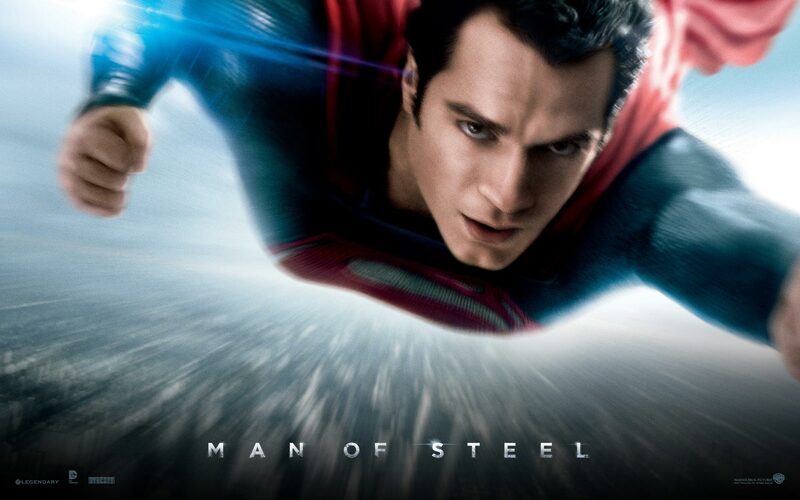 Man of Steel was filmed in 2D, and converted to 3D in post-production. I saw it in 2D, so I can’t speak to the quality of the 3D conversion. Production designer Alex McDowell (The Crow, Watchmen) shows us a Krypton unlike any seen before, Kryptonian space vessels, and a realistic Smallville and Metropolis. Costume designers James Acheson (The Last Emperor, Spider-Man) and Michael Wilkinson (300, Watchmen) flesh out Krytponian culture with an interesting design aesthetic, and Superman’s costume very much reflects his Kryptonian heritage. It’s a deeper blue, there’s no red underwear (consistent with his current costume in the comics), and it looks like it’s made of an alien material, but the new design works quite well. Hans Zimmer (Inception, The Dark Knight Rises) completes the mood with a dramatic score, but there were times, like Superman’s first flight around the globe and into space, where I missed John Williams’ iconic theme. Multiple companies provide the visual effects, chief among them Weta Digital (The Lord of the Rings, Avatar), and the results are spectacular. Alien worlds, flying (which has come a long way since the old Zoptic days), a city being destroyed, and super-battles in the sky and on the ground. They all look as realistic as the digital effects wizards can make them look. Henry Cavill is a new Superman for a new era. He’s not Christopher Reeve’s Big Blue Boy Scout, and it would have been a mistake to try to replicate that. Cavill’s Clark/Superman is more complex, facing questions and challenges Reeve’s Superman never had to. Like Reeve, though, he brings a natural charm to the role, and makes you believe in who he is. He more than capably delivers the heroism of Superman, while having the right physical look for the role. Amy Adams’ Lois is more tough reporter and less damsel in distress. She’s an important part of the action at times, and plays a key role in the defeat of Zod and his followers. She’s a trusted ally, not oblivious or a hindrance, and a keeper of Superman’s most important secret. Adams’ understated performance works. Some might raise an eyebrow at a red-haired Lois, but there’s precedent in the newspaper strips and 1990s comics. Michael Shannon cuts an imposing figure as Zod, a warrior dedicated to preserving Krypton at any cost, even genocide, and a man who doesn’t know the meaning of surrender. There’s a conviction in his eyes that makes him dangerous. He’s easily the most brutal and ruthless enemy Superman has ever faced on screen. Zod was previously played by Terence Stamp in Superman: The Movie and Superman II. Russell Crowe has a tough act to follow as Jor-El, previously played on screen by Marlon Brando, and he acquits himself well. His Jor-El is both a man of science and a man of action when necessary, as well as a proud, loving father. It’s hard to think of a better choice for Jonathan Kent than Kevin Costner, who creates an emotional core in his scenes with a young Clark. Ayelet Zurer is a solid Lara, while Diane Lane is a marvelous Martha Kent. The cast also includes Laurence Fishburne as Daily Planet editor Perry White; Antje Traue as Faora, Zod’s sub-commander; Harry Lennix as General Swanwick; Christopher Meloni as Colonel Hardy; Richard Schiff as Dr. Emil Hamilton; Cooper Timberline and Dylan Sprayberry as a 9-year-old and a 13-year-old Clark Kent respectively; Mackenzie Gray as Jax-Ur, a Kryptonian scientist working for Zod (he previously played an aged Lex Luthor clone on Smallville); Rebecca Buller as Daily Planet intern Jenny Jurwich; Alessandro Juliani as a military officer named Sekowsky (he previously played Dr. Emil Hamilton on Smallville); and Carla Gugino as the voice of Kelor, a Kryptonian service robot. A respectable cast across the board. Random things I enjoyed: the sheer joy when Superman takes flight for the first time; the nod to 1930s Superman when Zod and his followers are at first limited to leaping large distances rather than flying; and easter eggs for LexCorp (as in Luthor) and Wayne Enterprises (as in Bruce). If you’re inextricably wedded to the Silver Age comic book version of Superman, or the Christopher Reeve version, this film might not be your cup of tea. If you’re ready for a Superman for the 21st century, this film is for you. There are occasional missteps during its 143 minutes (incidentally, the same running time as Superman: The Movie), but taken as a whole, it’s a very good film and the best Superman film yet. If this is the beginning of a unified DC Cinematic Universe, it’s off to a fine start. David S. Goyer’s already on board to write the sequel and a planned Justice League film. I must confess…as a child, I had Superman pajamas, Superman underwear, Superman bed sheets, a Superman bath towel I liked to wear around my neck like a cape, a Superman cookie jar, and many more Superman items. I was introduced to him on the All-New Super Friends Hour. Superman: The Movie was as big a part of my childhood as Star Wars. Superman is still my favorite superhero. Man of Steel didn’t disappoint me. I still believe a man can fly.